Sprouts are wonder food due to its high nutritional value. Natural sprouts are good for a healthy body and mind development. It ensures blood purification and strengthens the immune system. In Naturopathy, sprouts are termed as medicine because of its preserving and promoting health aspects. Sprouts are associated with amazing health benefits of sprouting. Sprouts are known as health Rejuvenator and mood fresher. Sprouts are rich in fibre, protein, minerals, vitamins and enzymes, that’s why, they are known as miracle food. These are germinated seeds of legumes or grains which are full of rejuvenating and health promoting qualities. All legumes sprouts are packed of adequate protein and calcium. Salads are good appetizer. When salads are prepared by using sprouts; the nutritional value of salads increase manifolds. For different types of sprouts recipes; sprouts are used along with tomatoes, onion, broccoli, radish, etc. Anyone can eat sprouts. Sprouts are very important for patients and disease prone people. Adding cucumber, tomato, green chilli, coriander leaves lemon, onion, etc. increases its taste as well as nutritional value. If a healthy person takes sprouts regularly, he prevents himself from many diseases. Sprouts seeds are put in jars or wet clothes along with four times of water. After soaking water throughout the night, keep it in a clean cloth in the morning. Frequent sprinkle of water should be done in summer to retain moisture. It is easy to make sprouts in summer than winter. Growing of sprouts is an easy and a cost effective process; so it can be prepared be everyone. Seeds of Alfalfa, Sunflower, Soyabean, Gram, Soybean, Wheat, Moth, Moong, Lobia, Methi, etc. can be used for sprouts. Split peas, Kidney beans, Black beans, Pinto beans and Garbanzo beans are also used as sprouted seeds. Wheat sprouts germination are prone to fungus, so they should exposed to sunlight in the morning. Three wrong habits like Wrong eating habits, Wrong living habits and Wrong thinking habits along with junk and fast foods are the harbinger of acidity and hyper-acidity. It is more prominent in urban culture that leads to different lifestyle related disorders such asobesity. Sprouts are the surest answer to maintain balance between acidity and alkanity. Sprouts being one of the best natural foods greatly help to counter the acidity. If you want to reduce your weight, it is a wise step to follow high fibre diet. Sprouts are rich in fibre, having adequate nutrients, enzymes, protein, micro-nutrients and at the same time low in calories. So the obese people should regularly use sprouts in diet as it helps to fill your stomach and also reduces the feeling of hungriness. Therefor, sprouts are playing prominent role in weight loss. Brussel Sprouts are rich in many nutrients such as Vitamin E, Potassium, and Iron, all these are effective constituents for hair growth. Alfalfa sprouts are extremely useful for all round development of hair growth as it is endowed with sufficient amounts of vitamins such as Vitamin A, B2, B5, and K. Alfalfa sprouts also contain other nutrients such as folic acid, zinc, copper and magnesium, which are good for hair. More or less all types of sprouts having plenty of protein which is good for hair growth as more than 75 % of hair is constituted of protein. All these forms of sprouts with enriched nutrients are helpful in prevention of hair loss. Sprouts develop immunity against various diseases. Sprouts are full of antioxidants that contend free radicals and act as a panacea for many diseases. Excellent source of vitamins and minerals. The Starch present in Sprouts converts into glucose, fructose and maltose thereby enhances the digestibility and thus make it the superb food. Quite useful in getting rid of addictions because these suited to drug addicted people. Nutrients percentage of Vitamin C, Iron, Riboflavin, Niacin and Phosphorous increase after sprouting. Fenugreek (Dana methi) with curative powers treats Diabetes Mellitus andRheumatoid Arthritis. Gram sprout increases vigour and vitality. Sprouts are fresh and entirely living food. They are easily digestible, assimilated easily and provide quick energy. Chemical seeds should not be used for sprouts. Sprouts should be washed before eating. Sprouts easily infected with fungus, so safety measure should be taken care of. Eating of sprouts kept for long period is not advisable. Stale, stinked and dull sprouts should not be used. Cooking of Sprouts should be discouraged as they lose nutritive value. Cooking, frying and roasting of sprouts are not up to the mark of nutrition. Steam sprouts may be given to aged people for easy digestion. 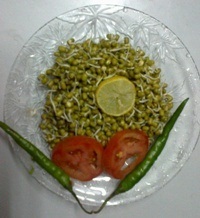 Moong bean is rich in Vitamin A, E and C.
Moong (lentil) sprouts recipe having ample protein and calcium. For ingredients, one can take each one cup of sprouted moong, chopped tomatoes, chopped cucumber. Coriander, Red Chilli and black salt may also be used. It is advisable to wash all the ingredients before making the recipe. It is always advisable to eat raw sprouts. Eating raw sprouts means taking lots of nutrients at a time. Cooking of sprouts loses the nutritional value. Therefore, cooking, frying and roasting of sprouts should be discouraged. However, in case of aged people, the sprouts may be steamed and it may also be grinded to make it paste. Moong bean is probably the easiest seed to sprout. It has a fresh flavour and adds taste to other foods. It is rich in Vitamin A, E and C.
The flavour of Fenugreek is somewhat spicy and slightly bitter. Fenugreek sprouts are known for curative powers. Such sprouts are used in curing of Diabetes Mellitus and Rheumatoid Arthritis. Since the ancient period, the sprouts of gram is used. Grams sprouts are known for enhancing of vigour and vitality. It also fulfils the requirements of vitamin and minerals in the body. Brussel Sprouts are endowed with Vitamins, and Minerals. It is also good for hair. Alfalfa sprouts are plenty of vitamins and minerals. If you want glowing and shining hair, you should opt to regularly to Alfalfa sprouts.